I received a copy of this book in exchange for an honest review for my stop on the blog tour at Donnie Darko Girl. What if everyone on Earth was already dead? When I skimmed over the synopsis for This Morning I Woke Up Dead, I stopped at the second paragraph and knew I HAD to read this. The plot was so original and fresh sounding - I couldn't imagine how this was going to work, but I was intrigued. Needless to say, I was not disappointed! We're introduced to Hadley and Dominic and get to know them and, through flashbacks, what their relationship had been like before Hadley's car accident. Mindy Larson has created an organic and believable relationship that made you ache for both of them to be together again. I really felt like I knew them and was right there with them. Once Hadley is given permission to contact Dominic, I had high hopes that he would realize he's already dead, too, so he could be with Hadley again. I worried that his intelligence would work against him, however, because he rationalized the inexplicable over and over again. Yet he also seemed open to possibilities he had never thought of before - he believed Hadley was visiting him every time he felt her icy touch. Only a quarter of the way in, I wanted him to come to the correct conclusion so he could be reunited with Hadley. This Morning I Woke Up Dead goes beyond Hadley and Dominic's love story. It made me think about life and death - what does it mean to be alive? Is there life after death and what is there before birth? I laughed and cried right along with the characters in trying to figure all of this out. The ending was so surprising - I never saw it coming in a million years. 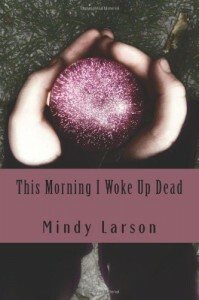 It was heartrending and uplifting at the same time - I don't know how Mindy Larson managed to make it both, but she did. I haven't been this touched by a book in such a serious way in a long time. I've been looking for a book that would make me feel the way this book has done. This is a book that once read, no matter how long it's been or how many books you've read in the meantime, you'll remember everything about it just by glancing at the title. This Morning I Woke Up Dead has that kind of staying power. I'm looking forward to the next book!